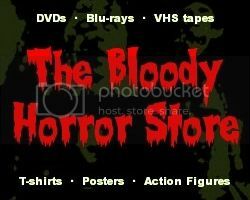 Even though true horror fans all have huge horror DVD collections (plus subscriptions to Netflix, Hulu, VuDu, and God knows what else), for most casual American viewers and "normal" people, October's horror movie selection will either be a choice of AMC's Fearfest or Turner Classic Movies. Nobody except little kids still watches the SyFy channel or Chiller TV, do they? When I was living in the UK, I was always envious of the horror movie marathons which were available in the US. We were only likely to get a horror movie (usually something by Hammer or Amicus) if Hallowe'en fell on a Friday or Saturday. The BBC and Channel Four had their moments, of course, but until Sky TV and Zone Horror upped the ante by repeatedly showing a load of crap, Hallowe'en usually involved an expensive trip to Blockbuster. You can say what you like about mainstream American television, its overload of commercials and its hypocritical censorship, but you still can't beat it if you are too lazy to keep swapping DVDs over. With the recession not really showing any signs of improvement, AMC and TCM have offered a very fine selection of classic horror movies for those of us who are also cheapskates. Here are the schedules (after the jump break) which I've reformatted so that they are easier to print out and tick off as you watch the movies on them. With the amount of repetition on AMC (and its disposition towards slasher movies which have nothing to do with the supernatural), TMC comes out the clear winner this year in spite of showing some really great horror movies at very inconvenient times.